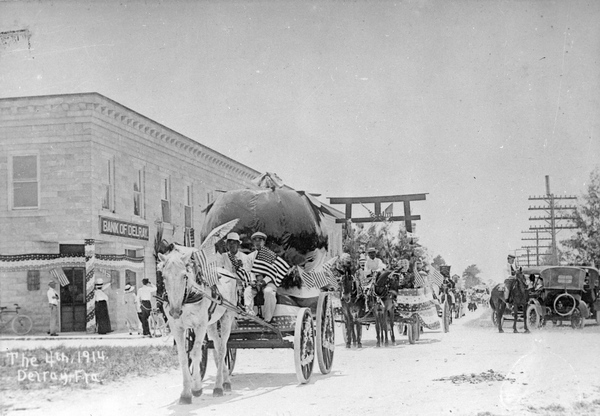 Early residents of Boynton and Delray celebrated Independence Day in ways very similar to the way we celebrate today. Leisure activities such as picnics, parades and swimming topped the list of events. Parades have long been a big source of entertainment. 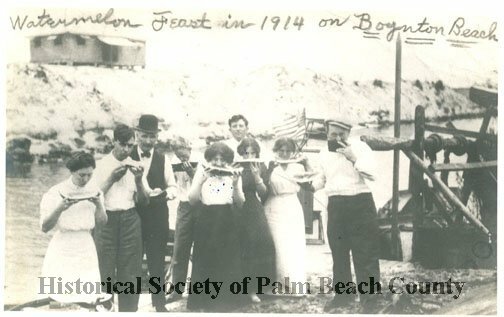 In 1914, Delray and Boynton teamed up to hold a big 4th of July celebration. Decorated floats like this one paying homage to the principal crop, the tomato, paraded down the street. The Boynton Inlet and the Boynton Casino were popular places for celebrating Independence Day. Games and contests were held along with a friendly game of baseball. Each family packed a picnic basket with homemade treats like fried chicken, coconut cake and fresh pineapple. Families would walk from town over the bridge carrying covered dishes and the baskets full of goodies. Children played in sand and surf and danced in the waves. Image courtesy Historical Society of Palm Beach County archive. Watermelon was and still is a popular menu item with people of all ages. Here a group of Boyntonites feast on homegrown watermelon. The expressions on their faces reflect the merriment of the holiday. Happy Independence Day from the Boynton Beach Historical Society! Tagged Atlantic Ocean, beach, Boynton Beach, Boynton History, celebrations, Delray Beach, History, Independence Day, Intracoastal Waterway, oceanfront, palm beach county, parades, picnics, pioneers, summer activities, traditions. Bookmark the permalink.